Four times a year the Bakersfield National Cemetery hosts a memorial service for unaccompanied veterans who were laid to rest without honors or family. BAKERSFIELD, Calif. — Four times a year the Bakersfield National Cemetery hosts a memorial service for unaccompanied veterans who were laid to rest without honors or family. Veterans and organizations gathered to pay their respects to three veterans, James Shearer (1938-2018) a Private with the U.S. Army and received a Vietnam Campaign Medal and National Defense Service Medal. Dallas Brasher (1930-2018) was a U.S. Air Force Senior Master Sargent and served for 24 years during the Korean and Vietnam War retiring in 1974. Ira Hilbern Jr. (1926-2018) served in the U.S. Army during World War II. 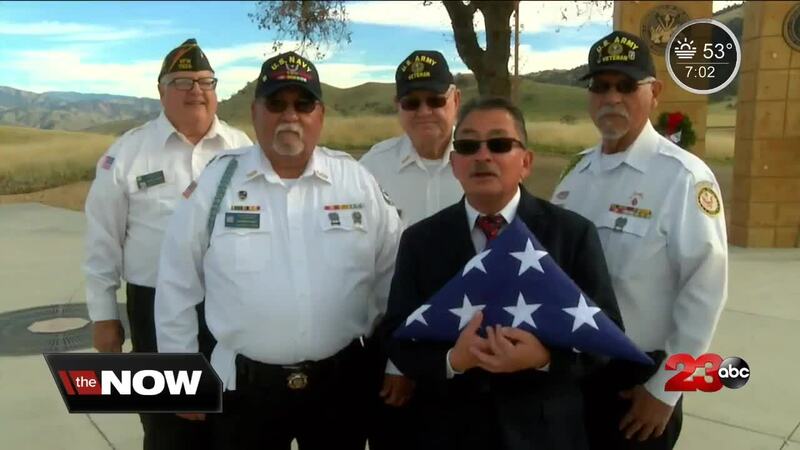 These ceremonies would not be possible without the help of several organizations said Pete De Los Santos, a representative for the Bakersfield National Cemetery. Santos gave a special thank you to Bear Valley Vets, VFW Quartz Hill Vets, Central Valley Vietnam Veterans and the Associated Veterans of Kern County. The Associated Veterans of Kern County Honor Guard performed at the ceremony, along with 400 other veteran memorial ceremonies this year alone. They pay for all of their uniforms, travel expenses and memorial engraved gifts out of their own pockets. If you are interested in helping the Honor Guard with their expenses you can make donations through the Associated Veterans of Kern County. For more information about donations you can contact the Kern County Veterans Service Department . The next Unaccompanied Veterans Ceremony is on March 21, 2019. For more information contact the Bakersfield National Cemetery . If you want the Military Final Rites from the Honor Guard for your family member, contact your funeral director, who will then contact the Kern County Veteran's Services Office at 661-868-7300.